Xtreme Fighting Championships, coming off a spectacular outing in Charlotte, has announced several fights on their Facebook page for XFC 20 “High Octane” on September 28th. 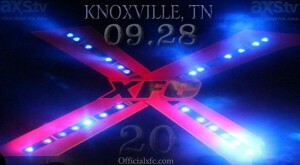 The promotion is returning to Knoxville, Tenn. for the second time this year and as always the best local talent has been tapped to fill the card.It should be noted this is the fourth trip to the Volunteer State in 2012 for the XFC with a fifth slated for December 7th in Nashville. Knoxville’s own and undefeated XFC fighter Scott “Hotsauce” Holtzman will be the co-main event for the night. Holtzman (2-0) is coming off of a first round TKO win in Nashville and will square off against fellow Tennesse lightweight Chris Coggins (6-2). Coggins took Nick Newell to the judges and has recently signed to fight in Bellator as well. Undefeated bantamweights clash for a battle of East vs. West when Tennessee fighters Nate “The Train” Landwehr squares off against Adam “Primetime” Townsend. Both men come into the battle at 1-0 as professionals and impressive amateur careers. Recently signed XFC bantamweight Shah Bobonis (14-6) faces undefeated Cornelius Godfrey (6-0) in a fight to determine a top contender in the weight class. Bobonis hasn’t lost since 2010 and Godfrey owns five submission victories and 1 TKO. win in his six outings. XFC signed Sofia Bagherdai (3-2) makes her promotional debut against Sara Maloy (3-2) in a bout that pits two Invicta veterans against each other in the highly competitive female division. Here is what the promotion has lined up so far for the event that takes place at the Knoxville Civic Coliseum on September 28th and airs live on AXS TV. Card is subject to change.